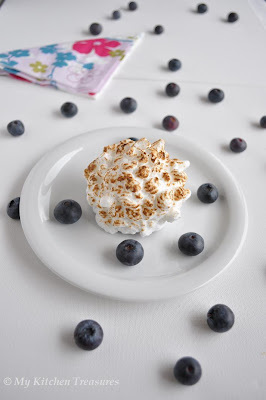 Begning of this Month when I read what the challenge was for this month I was really excited as I have never made baked Alaska. But then days passed by and then we had few parties at home and was always busy etc....that I almost went to the forumn to tell them that I am not joining this month. But then the last minute I changed, and boy am I so glad I did it. As when I served this for hubby and daughter this yesterday, they were full of praise, hubby even told for the next party I should make this for dessert. Ofcourse having a blow Torch is really handy to make this dessert. The August 2010 Daring Bakers’ challenge was hosted byElissa of 17 and Baking . For the first time, The Daring Bakers partnered with Sugar High Fridays for a co-event and Elissa was the gracious hostess of both. Using the theme of beurre noisette, or browned butter, Elissa chose to challenge Daring Bakers to make a pound cake to be used in either a Baked Alaska or in Ice Cream Petit Fours. The sources for Elissa’s challenge were Gourmet magazine and David Lebovitz " The Perfect Scoop "
6. Burn the tips of the meringue with a cooking blow torch. Or, bake the meringue-topped Baked Alaskas on a rimmed baking sheet in a 500°F/260°C oven for 5 minutes until lightly golden. Serve immediately. I have never baked this one either...looks so beautiful! Looks really very pretty. I think you're right, a blow torch makes all the difference here. Looks very pretty. Just reading thro the recipe, I feel exhausted and I can imagine the amount of work that went behind it. Finla, too cute!!! Unfortunately I can't see the first picture, but the second is just adorable! I'm glad your family liked them. Pretty presentation Finla. Love those small pearls in the picture. 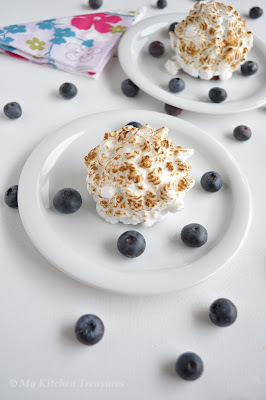 Those look beautiful, I do love baked Alaska! Those Baked Alaska look delicious! very well done! These are so cute HC - and glad your hubby and daughter loved them. Glad you could join us!! Wow looks super good finla..u know i too finished in hurry, even i too thought to skip this time cos of some commitment, and last minute some how managed to do it. Worth the effort and tasted yummy too right??? dear. Ooooooh Finla, these are gorgeous! How beautiful! I have a blow torch on my list, and am totally inspired by yours! Baked Alaska = YUM YUM, and browned butter makes it better! looks cute n yummy n tempting ones..
That was a beautiful take on the challenge! Well done! Cute and pretty looking baked alaska..yummy. Looks very pretty, I never made this, sure it's challenging. Well done HC. congrats for doing very well. looks fabulous!! Ah! your alaska looks perfect!! :)) so unlike mine.. haha! Like you, I enjoyed every step of this challenge. I even bought a torch specially for this occasion. Your Alaska is adorable and I love your decoration with the blueberries! Great job! Your baked Alaska looks absolutely delicious. I chose to make the ice cream Petit fours but after seeing so many baked alaskas work well I thunk I will have to make some of my own! Can't wait for next months challenge! I liked your blog very much. I appreciate for your wonderful presentation. Looks delicious and tempting. Looks great! Nice job on the challenge! No way HC. That looks so fantastic and I bet tastes absolutely delicious. Wow! I MUST take up daring bakers again! I was very proud of the baked alaska that I made in India that stayed put in spite of the Bombay heat! Not tried it since! baked Alaska looks so good...it is worth the effort! Thanks for the nice comments on my DB challenge creation... I love the look of yours! So cute, and so yummy looking.